Pastor David Cheni, Regional Coordinator for KIMI in Uganda. Ps David Cheni and wife Sarah, dedicated to KIMI and PowerClubs in eastern Uganda since 2007. 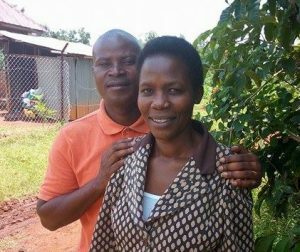 David and Sarah Cheni of Busia, Uganda, have planted PowerClubs in to reach orphans, needy children, and evangelize entire families and villages in eastern Uganda in and around the town of Busia. David and Sarah currently lead 152 active PowerClubs with over 7600 children in attendance every week! Many of them meet in the pubic schools. The Chenis have adopted 16 HIV orphans, also feeding other hungry children with little to no outside financial support. 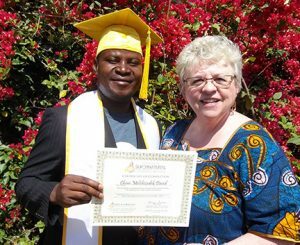 David has started a Bible school to train regional pastors, who seldom get an opportunity to go to any Bible school. David is the pastor of a local church of over 200 people, while also the founder and overseer of a “community school” of 300 children. Community schools are found in poor areas that cannot afford a typically funded government school. So, the people of the towns and villages find volunteers who have an education, who volunteer their time to teach the children. In addition, David tells us that the area member of Parliament is 100% in support for the children’s move of God, and has donated chairs for their ministry. David says he has asked the children to pray for him in the past because he trusts in the prayers of children. 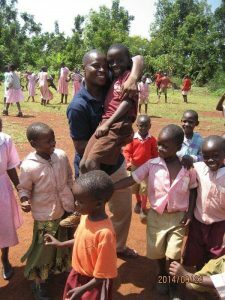 David with some of the children form Springs of Hope Care Ministries and Orphanage. From Sarah Nabwire, leader of Chosen PowerClub: My children can now sing power verses, take ten minutes praying and some are seen in deep intercession. One said that she saw Jesus giving them food while she was praying. Praise the Lord for this wonderful ministry. I know Brother David Cheni he is very faithful servant of God. I love him and wish him best of everything. I am praying for him.